These are tiny wild strawberries that just are not quite ready and never will be. Olivia picked these while we were at Granny's house last month. 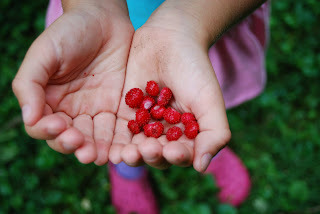 There is always something magical about finding little berries to pick. The girls collected as many as they could and made a nice pile for the squirrels to find. I enjoyed watching them explore the yard discovering all those little things grownups typically miss. They found several varieties of clover none of which had a 4 leaf in their patches. The hedges were large and roomy a perfect house for 4 little girls to play imaginary games. The only thing I wish they could have been able to do was take the path to the river. That path has so many memories, nearly 3 generations worth, the numerous ways to find wonder around every bend. As with everything time changes what was known. The path is still visible but not welcoming. The open trail has become buried under the thick growth of green forest. Endless years of no children breaking the path has left it to become lost and forgotten. That path was the gateway to our imaginary escape. For children raised in a suburban cookie cutter neighborhood this giant world of trees and greenery was a haven of fun. Our every visit revolved around how much fun we would have exploring those trails. We made the effort to be polite and give our Granny her 'hello' making conversation, being good little grandchildren, when really the only thing on our minds was to get into that forest and play. There would be audible groans when permission was not granted. How we longed to explore. What did we care that the trail was muddy or a little over grown, that wasn't a problem to us, we were kids those things make the experience better. If given the choice it was the path over treats. We'd rather play in the woods than sit. Those woods held the purest form of entertainment, our imagination. That's where we wanted to be, a place to become other people in other places in other times. What is more divine than that to a child? Hours of play could never bore us. We walked the paths we even ran them. Races were held up and down and around. Somehow we never tired of the running. There were numerous flowers all never seen in our suburban eyes. Ferns made excellent hiding spots for jumping out at cousins as they barreled around a corner. Large thick vines for swinging were few but of those we found were quite the sensation. The river was a place forbidden to us, yet we still made a visit time to time. We sat by its side watching the muddy water pass carrying with it sticks and other debris. Clam shells and rocks littered the banks and geese often chased us away. Downed trees were our fabulous bridges or high wires. Cars parts from old Chevys were an unusual find giving us more twists to the imaginary world. A cave was of interest but left alone, there we determined unmentionable monsters lived, allowing us to follow our parents' rule but still incorporating it into our world. Hearing our parents' voices calling us was the snap that woke us from our world. Being pulled away from the woods was an admission of reality. Our world had to be left behind for the normalcy of our lives. We would grumble and stomp our way back to the house feeling our time there was far too short. When I saw that path and the girls pointing asking all those memories filled my thoughts. And I, knowing the desire of a good exploration, denied access to my own excited girls. I regret it now. They may never know the joy of those woods, the fun, the wonder, the pure life it gives a child. The doorway is closed, keeping its secrets to itself.